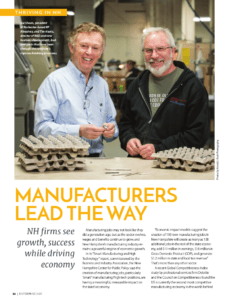 Privately held company RP Abrasives (RPA), located in Rochester, NH has been featured in the annual magazine of the Business and Industry Association – New Hampshire’s statewide chamber of commerce. The article titled Manufacturers Lead the Way highlights RPA’s specialized surface finishing capabilities and the impressive growth the company has seen over the past 21 years. BIA serves its members and the broader business community by focusing on relevant topics of interest, including energy costs; environmental compliance matters; labor regulations; healthcare quality, access, and cost; workforce availability and skills; and much more. RPA has become a leading surface finishing shop in New England, specializing in bead blasting, deburring, polishing, and passivating of metal machined parts. Their unique facility is located at Spaulding Industrial Park at the very tip of Rochester on Route 125. The eco-friendly facility offers the ideal location for employees as well as owner and manager, Joe Shean, to operate his company. Click here to access the full publication which includes RPA’s spotlight on pages 34-35.